Abiotic factors include all physical and chemical variables that influence the distribution and abundance of organisms. Current, substrate, and temperature often are the most important variables in fluvial environments, and all organisms show adaptations that limit them to a subset of conditions. Species differ in the specific conditions under which they thrive, and whether those conditions are narrow or comparatively broad. Habitat preferences can be inferred from the subset of environmental variables that best correlate with a species' distribution and abundance, with the important caveat that interactions with other species may further restrict the habitat occupied. Environments that are structurally either simple or extreme tend to support fewer species, and habitats that are more complex tend to support more species. How patterns in the abiotic environment are manifested across spatial scale, and the persistence of suitable conditions over temporal scale, add challenge to the task of deciphering organism-habitat relationships. Current and related hydraulic forces affect diverse aspects of the stream environment including channel shape and substrate composition, the physical structure and hydraulic forces operating in the benthic and near-bed microhabitats, and the balance between physical drag processes and the benefits due to the delivery of food, nutrients, and gasses and the removal of wastes. 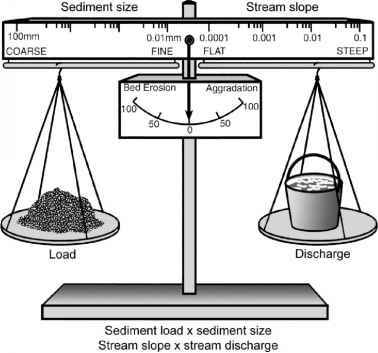 Most organisms live attached to, within, or associated with the streambed, where flows are turbulent and difficult to measure, especially at relevant scales. Considerable effort has gone into theoretical approaches and methods of measurement that can better characterize the flow environment experienced by organisms. Both simple and complex hydraulic variables can be effective predictors of the distribution of individual species and the overall abundance and richness of the invertebrate fauna. Even under "normal" flows many organisms will experience drag and lift forces, the short-term variability of which is called turbulence. At intervals, flows increase creating disturbance events on a longer temporal scale, redistribution, and possibly death. Thus the association of organisms with particular currents and substrates can reflect the ability of particular habitats to serve as refuges. Some invertebrates and fishes have been shown to move quickly into more sheltered habitats as flows increase, but in other cases it may be happenstance whether an organism is protected from flow during a spate. Substrate is a complex physical variable that includes inorganic and organic substrate types. It interacts strongly with current, which both influences substrate stability and is in turn influenced by bed friction; and with roughness, which creates complex, near-bed flow environments. The quantification of substrate requires multiple approaches, including size analyses for inorganic substrates, counts of wood, and descriptive categories such as leaf accumulations and debris dams. At the mesohabitat scale, channel units such as riffles and pools, and channel depth, while not strictly substrate categories, are analogous habitat categories for larger organisms, especially fish. Among inorganic substrates, gravel of intermediate size supports a diverse, lithophilous flora and fauna that have received a great deal of study by lotic ecologists. Terrestrial leaves that accumulate in streams and wood that modifies habitat and channel shape are important and well-studied organic substrates. Studies of the importance of substrate frequently are simultaneously studies of current, as these two abiotic factors are linked. Substrate size and heterogeneity appear to promote species richness, at least to a degree, and surface texture and roughness additionally promote abundance and diversity. The stability of the substrate and the protection it affords from the forces of current clearly are critical aspects as well. Temperature is a key environmental variable determining the metabolic rates of organisms, their distributions, and quite possibly their success in interacting with other species. Stream temperature usually varies on seasonal and daily timescales and among locations due to climate, extent of streamside vegetation, and the relative importance of groundwater inputs. For these reasons, thermal regimes are highly diverse and can vary on all spatial scales from microscale patches to the longitudinal gradient from headwaters to river mouth. Human activities can alter the natural temperature regime in many ways, including removal of shade-enhancing vegetation, changes to flow paths such as increased impervious surface, construction of impoundments, and of course by influencing the climate. Freshwater organisms exhibit a wide range of thermal tolerances that correspond to the thermal environment they inhabit, which may be cool or warm, constant or fluctuating. With few exceptions the organisms of running waters are ectotherms, and so external temperature governs their metabolism and growth. Although warmer temperatures generally allow greater activity, they also impose greater metabolic costs. A cold-blooded organism in warm water, with an inadequate food supply, quickly loses mass. Whether the evidence is based on lethal temperatures in the laboratory, detailed analysis of energy budgets, or field surveys, it is evident that temperature strongly affects distributions and abundances. The thermal tolerances of fish have received a great deal of study, and it is common in the temperate zone to speak of cold-water and warm-water fishes, which are typically arrayed along latitudinal and elevational gradients. The extreme sensitivity of cold-water fishes to micropatch differences in temperature is evident in their ability to at least temporarily reside in cool- and warm-water systems by using locations where groundwater inputs and shade provide suitable thermal conditions.